Want to play with larger armies? Enter the new forum (in English) dedicated to Impetus and Basic Impetus. Join the mailing list dedicated to Impetus and Basic Impetus. BASIC IMPETUS is the simplified version of IMPETUS. With BASIC IMPETUS you can play the same historical periods. 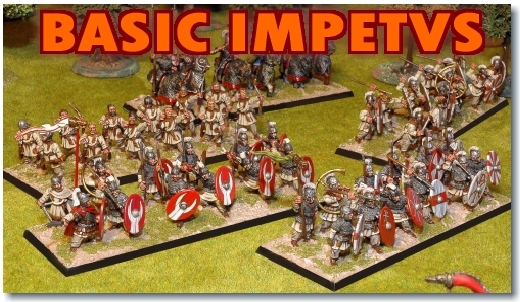 The basing system is the same, but you can field an army with just 7 to 10 Units (Bases). download now BASIC IMPETUS. It's free!! Vol 34 China, Korea and Japan in XVI Cent. 3) Only 1 Artillery A (or C) and 1 Artillery B can be used. In this case the total VBU must not exceed 35. 4) no more than 12 Units are allowed.